American Clock and Watch Museum — Bristol, Conn.
National Watch & Clock Museum — Columbia, Pa. The Hershey Story — Hershey, Pa.
Standard time ends at 2 a.m. Sunday morning when we “spring forward” to daylight saving time by turning our clocks forward one hour. As you reset the clocks on the microwave, the TV and the bedside alarm, imagine yourself watching time fly in one of these clock-worthy cities. The antique, four-sided clock at New York City's Grand Central Terminal is very accurate and, due its opal faces, very valuable. 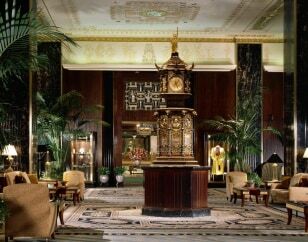 The intricately carved bronze clock at the Waldorf-Astoria hotel in New York City was originally a gift from Queen Victoria to the United States for the Chicago World’s Fair in 1893. Built in 1847, Boston’s Custom House was for many years the city’s tallest building and the city’s first skyscraper. Once the duty-paying point of entry for ships entering the Port of Boston, the building is now a Marriott timeshare/hotel that hires a certified clock specialist to maintain the giant (22.5 feet in diameter) clock in the tower that was added to the building in the early 1900s. Bily Brothers Frank and Joseph carved this clock to honor Czech composer Antonin Dvorak, who spent time in Spillville, Iowa. 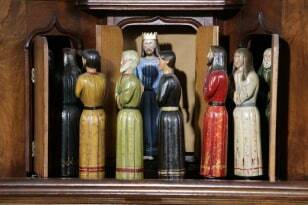 Where to watch these clocks: The Bily Clocks Museum & Antonin Dvorak Exhibit. Winnsboro, S.C., claims to have the oldest continuously operating town clock in the United States. Where to watch this clock: Winnsboro, S.C. The "clock forest" at the American Clock & Watch Museum in Bristol, Conn.
Museum curator Carter Harris resets one of the museum's many clocks for Daylight Saving Time. 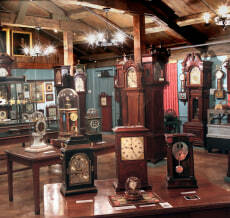 With an 11-foot-tall French Statue Clock, German musical clocks and more than 12,000 other clocks, watches, clock-making tools and other time-related items in its collection, the National Watch & Clock Museum in Columbia, Pa., is the most comprehensive horological collection in North America. Figures from the Apostolic Clock at The Hershey Story, The Museum on Chocolate Avenue in Hershey, Pa.
As you might imagine, The Hershey Story — The Museum on Chocolate Avenue, in Hershey, Pa., doesn’t focus solely on clocks, but there are close to 20 clocks in the collection. Unique among them is the Apostolic Clock, built by John Fiester in 1878. Fiester toured Pennsylvania with the timepiece, advertising it as “The 9th Wonder,” and charged people 10 cents to see the clock’s procession of Christ's 12 apostles. The clock doesn’t just tell the time of day: Dials on the face count seconds and mark the phases of the moon, the months, the date and day of the week and the signs of the zodiac. The clock is only operated periodically, so check the schedule to find out when the mechanical figures will be appearing. Prague's Astronomical Clock is 600 years old. Outside of the United States, there are plenty of other great clocks to include in your travels. London, of course, has Big Ben. Nearby Greenwich is the home of Greenwich Mean Time, the Prime Meridian of the World and the Royal Observatory, which has Time Galleries filled with some of the earliest timekeeping instruments. In Vancouver, B.C.’s Gastown neighborhood, a clock partially powered by a steam engine entertains visitors. A giant glockenspiel (carillon) dating back to 1908 draws crowds to the town hall in Munich’s Marienplatz for three shows daily. Prague’s Astronomical Clock recently celebrated its 600th anniversary. And the World’s Largest Four-Sided Clock Tower is currently under construction in the holy city of Mecca, Saudi Arabia.